The 3-star Hotel Basilea in Igea Marina is family-run, close to the beach and ideal for families. It has free parking for all guests, free WI-FI and air conditioning. The hotel is located in the center of Igea Marina near the beach, which can be reached in one minute on foot. The Polo Est, center of events and entertainment on the beach, is about 5 minutes on foot, while the center of Bellaria can be reached by public transport or by car in less than 10 minutes. The rooms have a balcony, satellite TV and digital terrestrial, telephone, safe, air conditioning, WI-FI, private bathroom with shower, hairdryer and complimentary toiletries. The hotel has a lift, an air-conditioned restaurant, a reading room, a TV room and a 24-hour front desk. Organize theme nights. PARKING : free of charge for all customers. SERVICES FOR DISABLED : the structure has an entrance on the ground floor, a lift for disabled people and a camper with ample room for maneuver as well as standard bathrooms (shower with wheelchair access). BREAKFAST : buffet, with sweet and savory choice. LUNCH AND DINNER : typical local cuisine with 3 choice menus and fish dishes every day, followed by a buffet of vegetables and desserts. VARIATIONS : vegetarian dishes are available. Pasta and desserts are homemade. 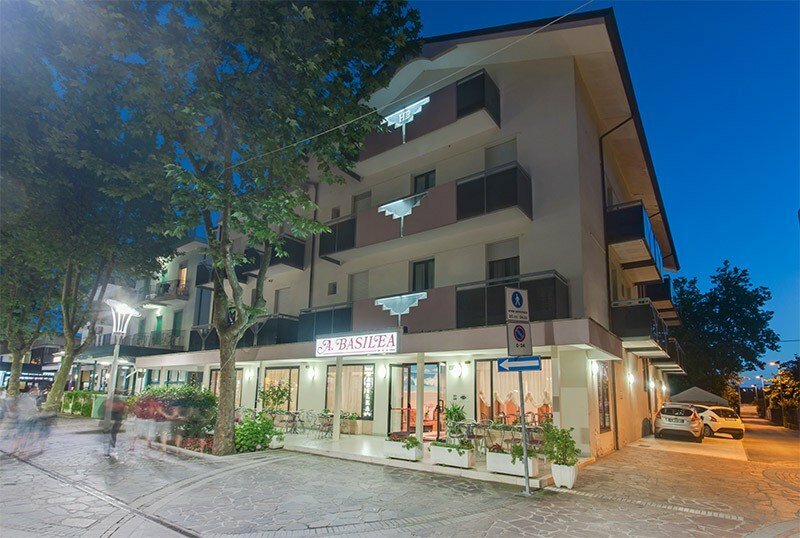 The hotel has an agreement with the Bagno Marco bathing establishment n. 66 - 67, equipped with sunbeds, beach umbrella, showers, bocce courts, table tennis and games for children with daily entertainment service, as well as dances and gymnastics with qualified instructors. Included: Full board with drinks at meals, air conditioning, beach service, free Wi-Fi and car parking.